I have finished setting up hail to run on the cluster, and this document summarizes what needs to be done in order to run hail on cluster, in both standalone and cluster modes. But it must be noted that I had to do a lot of hand-setting configurations to make this work. First, it is worth noting that the spark distribution we have on cluster is only compatible with python 2 – if you have a default python3 directory and PYTHONPATH set, you may need to disable these. Take note that although the spark tutorial from CSES states that you should run module load python, I found that you actually need to run module run anaconda for data structures necessary for hail to run. These commands will load all the necessary binaries. You’ll see that this command also needs to be included in the .slurm file. /tigress/BEE/spark_hdfs/hail. Disregard the hadoop and spark directories in spark_hdfs – we’ll stick to the modules installed by CSES at Della. Take note that the environment variable PYSPARK_DRIVER_PYTHON needs to be set differently depending on whether you’re running standalone mode with jupyter notebook or cluster mode. PYSPARK_DRIVER_PYTHON_OPTS also needs to be set in order to allow for ssh tunneling to run the jupyter notebook (but not in cluster mode). Also take note the JAVA_HOME directory – setting this is not mentioned by the CSES spark tutorial, but I’ve found that setting JAVA_HOME to another directory makes spark not work. This script submits a job with 6 cores (1 node, 3 tasks per node, and 2 cpus per task). Adding the configurations total-executor-cores, –executor-memory were not detailed in the hail tutorial but they are suggested by the CSES tutorial. This part is pretty simple – you just need to remember that our cluster doesn’t have a dedicated HDFS or other file system used by Spark – so all file addresses need to be prefixed by file://. 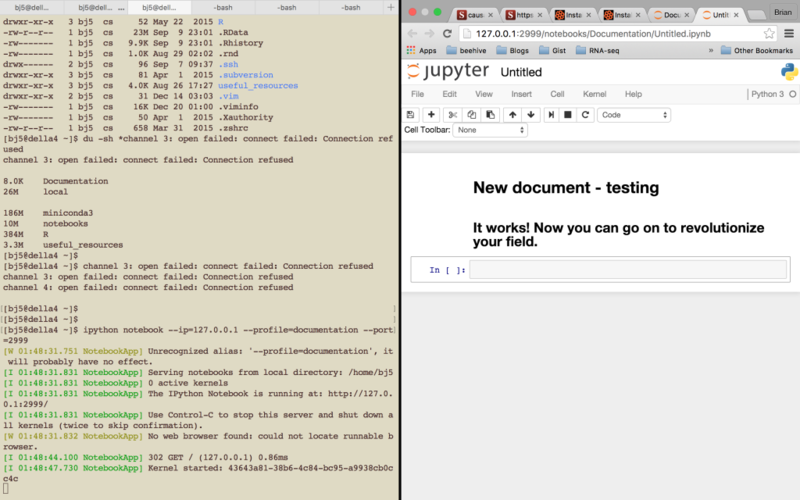 The part that gave me the most trouble (and is still not fully resolved) is running a spark-enabled jupyter notebook. making sure that the master address is correctly set. The conf variables spark.sql.files.openCostInBytes, maxPartitionBytes, spark.sql.files.maxPartitionBytes and spark.hadoop.parquet.block.size were recommended to be set only for cloudera clusters in the hail tutorial, but hail doesn’t work if we don’t set these variables. with the pre-defined sparkContext variable sc. states that it is also compatible with spark-2.2.0, so building from source using the github directory may be a good option as well – this is what I ended up doing on my local machine. But the good news is that now hail jobs with spark can be set up and run on cluster!